Emerging from a recent dive 40 feet below the surface of the Puget Sound, biologist Ben Miner wasn't surprised by what he found: The troubling disease that wiped out millions of starfish up and down the West Coast had spread to this site along the rocky cliffs of Lopez Island. He and another diver tallied the grim count on a clipboard he had taken underwater. Only two dozen adult starfish were found in an area where they once were abundant. But Miner's chart also revealed good news - a few baby starfish offered a glimmer of hope for the creature's recovery. In scattered sites along the Pacific Coast, researchers and others have reported seeing hundreds of juvenile starfish. 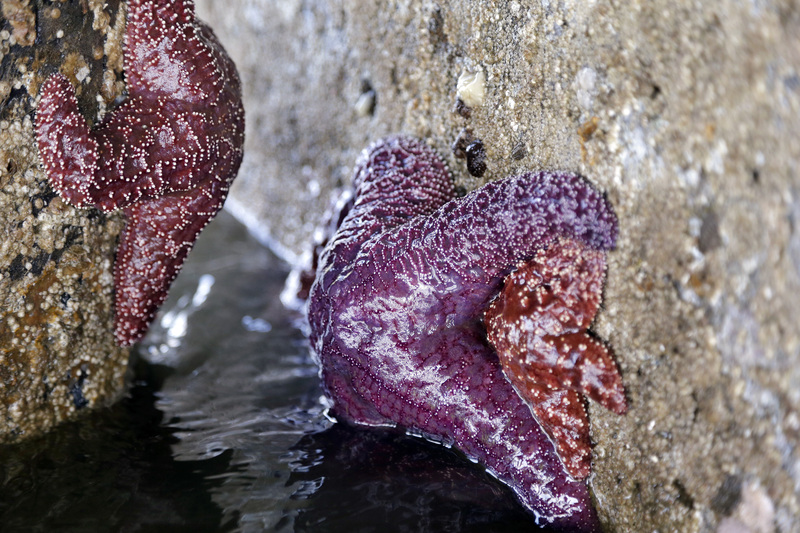 The discovery has buoyed hopes for a potential comeback from a wasting disease that has caused millions of purple, red and orange starfish, or sea stars, to curl up, grow lesions, lose limbs and disintegrate into a pile of goo. "Babies. That's what we hope for," said Miner, associate professor of biology at Western Washington University. "If you're hoping for sea star populations to recover, it's the best news you can get to be able to go to sites and see that there are babies." At one site in Santa Cruz, California, more babies were counted in the past year or so than in the previous 15 years combined, said Pete Raimondi, professor of ecology and evolutionary biology at the University of California, Santa Cruz. Not all the sites have seen juveniles and it hasn't been broad. "It doesn't mean all the sites do. It means something is going on up and down the coast and it's a good sign," Raimondi said. Miner said juveniles, while not entirely immune, might be less susceptible to a virus fingered as the likely culprit of the sea star wasting disease, a sickness that has devastated about 20 species of sea stars from Alaska to Baja California since it was first reported off the Washington coast in June 2013. Last fall, Miner, Raimondi and a team of scientists published new research linking a variety of densovirus to sea star wasting disease. Now, biologists like Miner and others are shifting to a new phase of study. They are tracking whether baby starfish survive and what happens when a key predator of urchins, mussels and other species is lost. Juveniles were observed at some sites before adults died and many appeared to have survived after the die-offs, Miner said. One theory for why there are so many juveniles is that when adult starfish were stressed from the wasting disease, they released millions of eggs and sperm, increasing the chances for fertilization. Ideal conditions in recent months have helped push those larvae to the shore, where they're able to cling to hard surfaces such as rocks and pilings to grow. Now, Miner said, "the question is when these babies get big, will you expect them to die like the adults?" Raimondi added it will take a few years of monitoring to know for sure whether the sea stars will grow and repopulate. And it's too early to say how the ecosystem will change in their absence. Scientists worry the loss of starfish could reshape coastal communities because they are top predators. There have been reports of sea urchins moving into areas where starfish once dominated. And the worst of the wasting disease might still be ahead in some places, including along Washington's Olympic Coast, where it was first reported in June 2013. Steve Fradkin, a coastal ecologist with Olympic National Park, said the disease first infected about a quarter of the sea star population there. It all but disappeared last summer until this winter, when surveys again found the disease infected about 50 to 60 percent of the population. The latest survey in mid-April found the disease had waned again - affecting just 30 percent of the population - but researchers are keeping a close eye on the area. During the first low daytime tide a few weeks ago, Peg Tillery and three naturalist volunteers inspected pilings on Hood Canal, armed with a tape measure and clipboard to record as many adult and baby sea stars they could find on a set of pilings. "I found more babies to count," Tillery called out to the others. "Look at this guy and this guy. They're all healthy." "There was a period of time when we found none," said another volunteer Barb Erickson. The women work quickly, as the tide recedes to reveal purple and orange sea stars clinging to barnacled pilings. They find babies hiding in crevices, some too small or tucked away to measure but all appeared healthy. They record 10 juveniles, some about the size of a quarter, 18 adult sea stars during that bi-weekly survey. "We want them back," said Tillery. "They're part of the ecosystem. If they go away, what goes away next?"